Todd Miller represents clients in labor and employment and employee benefit matters in the United States courts, Federal administrative agencies and private arbitrations. He regularly handles matters such as ERISA collections, audits and withdrawal liability claims, union jurisdictional disputes and unfair labor practices. His prior experience as a union-side labor attorney gives him a unique perspective to help resolve labor and employment law problems for businesses and individuals. He also advises people who need help understanding their rights and obligations as union members or collecting their pensions and other benefits. Todd received his J.D. from Chicago-Kent College of Law in 1993 and a Master of Laws (LLM) in Health Law from DePaul University College of Law in 1997. He graduated from Indiana University in 1990 with a B.A. in Psychology. Todd is admitted to practice before the United States Court of Appeals for the Seventh Circuit, Illinois State Courts and U.S. District Courts for the Northern District of Illinois, Central District of Illinois and Northern District of Indiana. He is a member of the Trial Bar of the U.S. District Court for the Northern District of Illinois. Todd is a member of the Federal Bar Association. 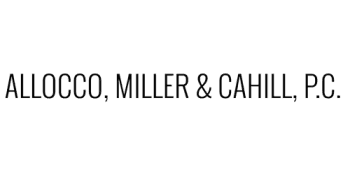 Allocco, Miller & Cahill, P.C. Boniface F. Allocco has over 20 years of experience in real estate law. He has represented clients in a variety of matters, from the first time home buyer to the commercial developer. In today’s complicated real estate market, he has the experience to provide his clients with the expertise that they deserve. Mr. Allocco takes pride in providing his clients with personal, professional representation. In order to ensure quality and satisfaction, he personally consults with his clients in order to determine their individual wants and needs, and he personally tends to all legal matters. Mr. Allocco is also a licensed real estate broker and is a title agent for several title insurance companies. Mr. Allocco received his J.D. from Chicago-Kent College of Law in 1993. He graduated from University of Illinois at Chicago in 1990 with a B.A. in English and a minor in political science. Kathleen Cahill practices labor and employment law, representing employers in litigation before state and federal courts and administrative agencies such as the Equal Employment Opportunity Commission, Illinois Department of Human Rights and Illinois Department of Employment Security. She regularly represents clients in matters involving ERISA collection and alter ego actions, union wage and trust funds compliance audits, withdrawal liability claims and employment discrimination. Ms. Cahill received her law degree from the John Marshall Law School in 1999 after receiving her undergraduate degree in political science from Loyola University Chicago. She is admitted to practice in the Illinois state courts and the U.S. District Court for the Northern District of Illinois. Megan Moore practices labor and employment law, representing management in ERISA collection actions, audits and withdrawal liability claims. She also handles union jurisdictional disputes and other civil litigation matters, including employment discrimination claims. Ms. Moore received her J.D. from The John Marshall Law School in 2014. She graduated from DePaul University in 2010 with a B.A. in Communication. She is admitted to practice before the Illinois State Courts and the U.S. District Courts for the Northern District of Illinois and Central District of Illinois.